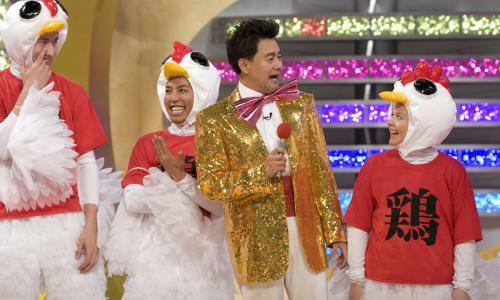 Even if you have never set foot in Japan, there is a good chance you have heard of the unbridled wackiness that is Japanese television. Believe it or not, the inanity that is makes up the bulk of silly game shows and variety shows can be a treasure trove of kanji and listening knowledge for all those who are trying to master the Japanese Language Proficency Test. Personally, I have never been a big proponent of the "brute force" kanji learning method that is all the rage with flashcard aficionados. Rather, I learn by reading, making note of new kanji, reviewing and then looking for them in my everyday life. I have found that the much maligned (and not without a good reason) Japanese TV world is a perfect way of putting kanji and listening together. Japanese TV shows have heaps of subtitles, especially "wide shows" (ワイドショー or daytime gosip shows aimed at housewives), variety shows, quiz shows, and comedy shows. These are "hard subtitles" that are presented as part of the show to presumptively add emphasis. TV shows--comedy in particular--tend to feature fast speaking guests. In addition there are a lot of fast paced back-and-forth exchanges which mimic the style found on the JLPT listening test. TV news shows are a good are a good way to practice listening to technical Japanese. Since news programs have both pictures and hard subtitles, it is a good warm up before you move on to radio. There are plenty of quiz shows designed solely to test and subsequently embarrass various Japanese celebrities. Many of these shows include kanji writing and trivia. Far and away the most compelling reason to watch Japanese TV is to take advantage of the obscene amount of subtitles found in just about every show. The excessive use of subtitles makes it easy to match speech to to kanji and, in my own experience, it has been a great way to form a solid mental link between vocabulary, spoken Japanese, and kaji. Do you have any tried and true Japanese study tips? If so, let us know in the comment section! What's it Like to Move in Japan? Shaken: How Much Does it Cost?